60 minutes of reserved party time. Additional $50 fee per half hour if your party extends past 1 hour. ​​​All pottery is subject to change and availability; however, special requests are welcome. Birthday child will receive a complimentary tot plate from Happy Hands with his or her name, handprint, signed by all guests. A larger plate with artwork is an additional $35 and up. Custom art requests are subject to an additional fee (starting at $25 and up) and artist approval. Party hosts bring paper goods, balloons, food, beverages for the kids, & cake. We'll take care of you from set up to clean up. Non-refundable $50 deposit is due to reserve date and time. Final balance is due at the party. $250 plus Tax for 10 painters. $20 per additional child. Invite up to 45 total guests to share in the fun! Additional $50 fee per half hour if your party extends past 1.5 hours. Party hosts may bring food, beverages and cake.We'll take care of you from set up to clean up. 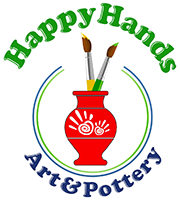 ​We discourage parents from painting their child's pottery during the B-day parties as that leave the child disengaged and missing out on a fun event. Party parents & grandparents of course are welcome to stay and enjoy the party. Non-refundable $75 deposit is due to reserve the date and time. Final balance is due time of party. All pottery will be ready within 7-10 days and individually wrapped for easy pick up or distribution. We can deliver finished pottery for $30 per destination within 10 miles of our studio. Unfortunately due to space limitations all finished pottery must be picked up by the party parent within 1 month after notification of completion. ​$350 plus Tax for 10 painters. $25 per additional child. Invite up to 45 total guests to share in the fun! Gratuity are not included, but greatly appreciated. $450 plus Tax for 10 painters. $35 per additional child. Invite up to 45 total guests to share the fun! Perfect creative party experience for your child! You, as the host, will choose the pottery your child and guests will paint. Recommended for smaller groups under 6 kids. The charge for the group would the cost of piece(s) + Dipping/firing per piece + Tax. To make a table reservation there is an initial $50 nonrefundable deposit to hold your time slot and it gets redeemed on the day of transaction. You may reschedule for a different time or date if another arrangement has come up. No refunds. Please feel free to bring any food, cake or beverages. There is $50 charge for extra studio time, paper goods, balloons and all table clean up accommodations for your party. ​Gratuity are not included, but greatly appreciated.